Thulme Falls Conservancy was established as part of government’s land use decision for the North Coast planning area. Thulme Falls Conservancy protects Thulme Falls, which is a highly scenic waterfall that drops directly into Quottoon Inlet. The waterfall is a local tourist attraction. The conservancy is part of a system of marine protected areas and anchorages along the north coast in the Portland Canal/Work Channel area. There are no facilities in the conservancy. 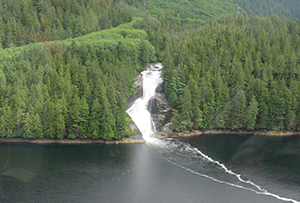 The conservancy is located approximately 20 kilometres northeast of Prince Rupert. History: Thulme Falls is in an area known to the Coast Tsimshian as K’ala Kwtuun. It is an intensive traditional use area that is considered part of the Coast Tsimshian “breadbasket”. For millennia the area has been, and continues to be, an important source of natural resources for food, medicines, cultural materials, and economic goods. Cultural Heritage: The Coast Tsimshian have strong cultural interests, including the desire to pursue their traditional activities as they have done for millennia, in a manner that sustains the biological diversity and natural values of the area. The conservancy is within the asserted traditional territories of the Coast Tsimshian, and specifically within the tribal area of the Gitsi’is Tribe, one of the nine tribes that together make up the Coast Tsimshian. The Coast Tsimshian have numerous harvesting and gathering sites in the area, and in the adjacent and nearby foreshores and waterways. There are eighteen Indian Reserves located in Work Channel. To date, no known archaeological sites have been recorded within the conservancy although there are 33 documented archaeological sites along Work Channel thus far. The lack of identified archaeological sites in Thulme Falls Conservancy is typical for the British Columbia north coast where few detailed archaeological assessments have been completed. Future archeological site inventories may yet identify additional cultural heritage and archaeological resources within the conservancy. Conservation: Knowledge of the conservancy’s flora and fauna, especially ecosystems, ecological communities and species of conservation concern, is incomplete. The 0.6 kilometres of shoreline in Thulme Falls is highly sensitive to sea level rise. Climate change impacts to ecosystems, ecological communities and species of conservation concern may be mitigated through adaptive management. Intertidal species populations are small and may be susceptible to increases in harvesting. Wildlife: Marine wildlife species that have been recorded in or near the conservancy are; harbour porpoises, humpback whales, killer whales, and marbled murrelets.